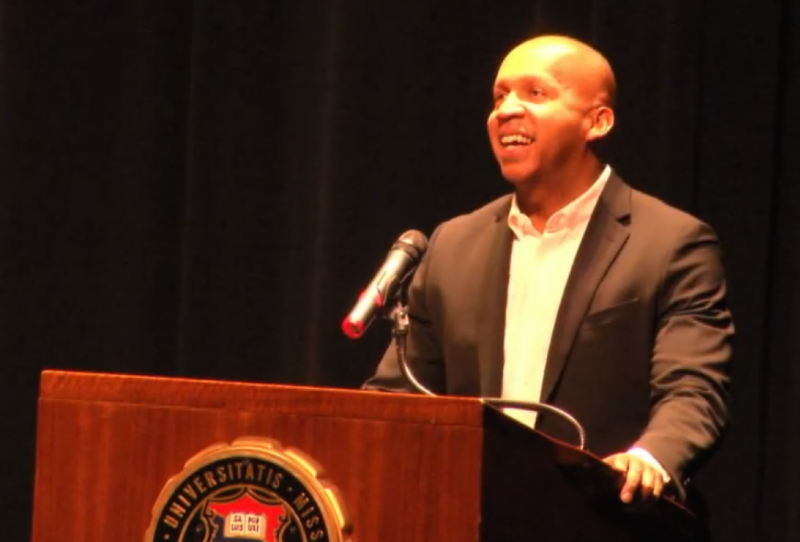 The University of Missouri hosted a speaking event for New York University Law Professor and Director of the Equal Justice Initiative Bryan Stevenson in Jesse Hall last weekend. Professor Stevenson visited MU to discuss the movement against mass incarceration in the United States, a movement of which he is a staunch advocate. “Today there are 2.3 million people in jails and prisons, the United States now has the highest rate of incarceration in the world,” Stevenson said as he spoke to his crowd in Jesse Auditorium. The United States accounts for 5% of the world’s population, yet is the source of more than 20% of the world’s prison population, according to the American Civil Liberties Union. “There are collateral consequences to mass incarceration, we disenfranchise people,” Stevenson said when discussing the significance of the U.S. being the world’s largest jailer. In addition to having more citizens incarcerated than any other country, there is also a large racial disparity within this system. The focus on the large amounts of ethnic minorities populating the United States’ prison system opened up Stevenson’s message to the championing of racial equality among all sections of society. “Today in Alabama, 31 percent of the black male population has permanently lost their right to vote as a result of a criminal conviction,” Stevenson said. As a native of Alabama, Stevenson noted in his speech the racial injustices that permeate throughout the U.S. As a child Stevenson briefly attended a formally segregated elementary school. Throughout his speech, he told many stories of being personally mistreated due to the color of his skin. Despite his many experiences with personal inequality, Stevenson preached a message of understanding, education and progress. “I think there are things we can do even on this campus, certainly in this community, certainly in this state, to create a more just society,” Stevenson said. According to the Bureau of Justice Statistics, 1 in 3 black male babies born in the United States are expected to go to jail or prison in their lifetime. Stevenson said this statistic keeps him up late at night, and fuels his passion for promoting justice and equality in the U.S.’s correctional system. Stevenson founded the Equal Justice Initiative in 1989 with the purpose of providing legal representation to those who may have been denied a fair trial. He currently holds the position of Director for this non-profit organization. The Equal Justice Initiative continues their work to provide litigation to condemned prisoners, juvenile offenders, people wrongly convicted or charged with violent crimes, poor people denied effective representation and others whose trials are marked by racial bias or prosecutorial misconduct. Stevenson’s visit aimed to bring awareness to the enormous levels of incarceration in the U.S., and the racial imbalance that characterizes it. According to Stevenson, the solution to creating a more equal and fair racial atmosphere in the U.S. is through having difficult conversations with one another that challenge the narrative of U.S. history. For more information on the Bryan Stevenson and the Equal Justice Initiative, you can visit www.eji.org.